Ricardo’s progress in the thriving offshore wind industry continues with the signing of an engineering services contract with David Brown, a leading global provider of industrial gearing solutions and support services. Following David Brown’s announcement of its collaboration with Samsung Heavy Industries (SHI) to design and manufacture an innovative 7MW gearbox for a new range of offshore wind turbines, Ricardo is delighted to announce that it has been selected by David Brown to provide a range of engineering support services for this project. Ricardo will undertake support activities covering concept review, dynamic analysis, validation of detailed component and system analyses, and assistance to the drivetrain rig and field testing in order to facilitate the final certification process. David Brown has a highly successful history in both the design and manufacture of complex, innovative gear systems and will work in close collaboration with SHI to develop an innovative 7MW wind turbine gearbox that can, through its compact, modular architecture and low weight, lower the cost of energy. Ricardo will work alongside David Brown to provide an additional assurance step in this project for both David Brown and its customer. Ricardo was selected for this task owing to the company’s experience and deep understanding of the full product development life-cycle requirements in this sector, and for its capabilities in design review, analysis and product validation, which will be important success factors in this project. The project has been launched with key initial deliverables scheduled to support delivery of the first prototype gearboxes in the coming year, with follow-on work in support of test and certification activities. 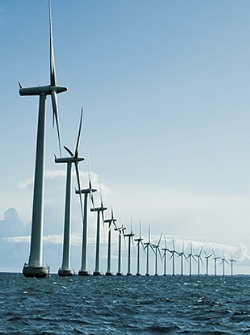 Offshore wind is set to be the major growth area in the wind turbine market, with manufacturers requiring high quality, reliable solutions that offer improvements in the through-life cost of energy. In addition to this project, Ricardo is also actively developing its clean energy business further in other areas including marine energy, energy storage and smartgrid systems, concentrated solar power, fuel cells and combined heat and power systems. Commenting on the contract award, Martin Fausset, managing director of Ricardo UK, said: “Offshore wind presents a huge opportunity for many businesses, not least in the UK, and I’m delighted that we have been chosen by David Brown as a provider of engineering support services for their new multi-MW gearbox. This project builds upon the solid foundations laid over the last year in our other wind programmes. Ricardo is delighted to be working with David Brown and looks forward to developing the relationship further and capitalizing on the growing offshore wind market”.